Marble. 31 BCE — 14 CE. On account of a quite considerable resemblance with portraits of Octavia Minor represented on coins, as well as a certain likeness to a portrait at the Getty Museum which has also been called Octavia, the present portrait has come to be known as Octavia (c. 70—11 B.C. 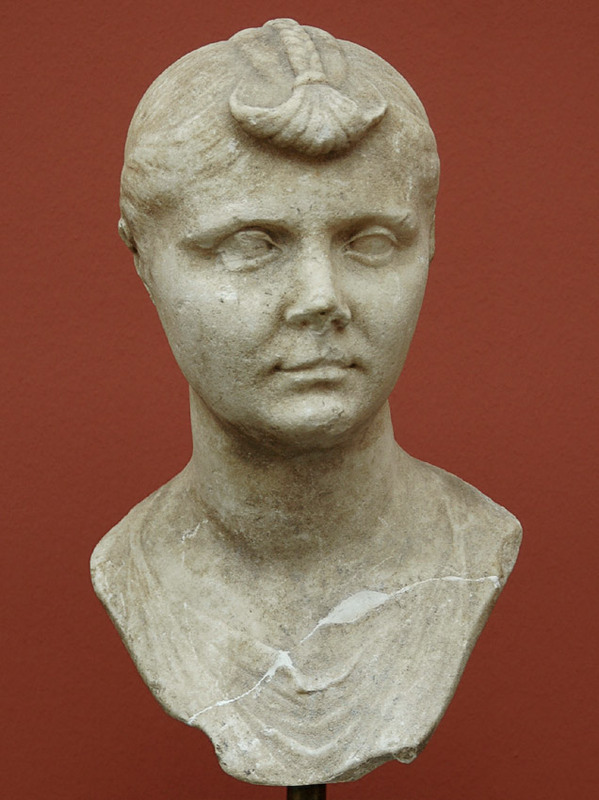 ), the sister of Augustus, married to Mark Antony 40 B.C. Furthermore, the portrait is a replica of a head in Toulouse found together with Livia and Claudius. Around the bust section, there is a garment, a stola, which is distinctly characterized. Original: Early Augustan era. Copy: Early Augustan. The nose and the upper lip have broken off and they are missing. The eyes are battered. Acquired in 1895 in Frascati, with a number of other sculptures, through the mediation of Helbig. Helbig stated that the portrait was found, together with Claudius (60) and Livia (38) at Cerveteri, either in the theater or in Gens Julia’s temple. F. Poulsen 1951, Cat. 619; V. Poulsen 1973, Cat. 41; P. Erhart, GettyMusJ 8 (1980) 126, fig. 5; Fittschen & Zanker, Porträts III, 42f og n. 3, no. 49; Scholz, Tracht, 51, no. 4; D. Boschung, JRA 6 (1993) 43—44. © 1994 F. Johansen. Catalogue Roman Portraits, vol. I, p. 108, cat. no. 42.